Again, one of the largest events associated with hip-hop in particular the dance breakdance. Again, because the records of popularity were again beaten. More than 30 000 spectators during the two-day event, not counting the tens of thousands of spectators watching Warsaw Challenge during a live broadcast on the Internet. Within seven years the event went far beyond the hip-hop environment. Last edition of Warsaw Challenge, as usual, brought changes. The first of these was the fact that in addition to the usual full two days in amphitheater, event fans around the world for the first time had the opportunity to watch the entire event on-line! Tens of thousands of fans from around the globe took advantage of this possibility. Cult Warsaw Challenge was visited by the whole families interested in acrobatic evolutions and mass of positive emotions. Warsaw Challenge 2011 was extremely successful thanks to a number of factors. 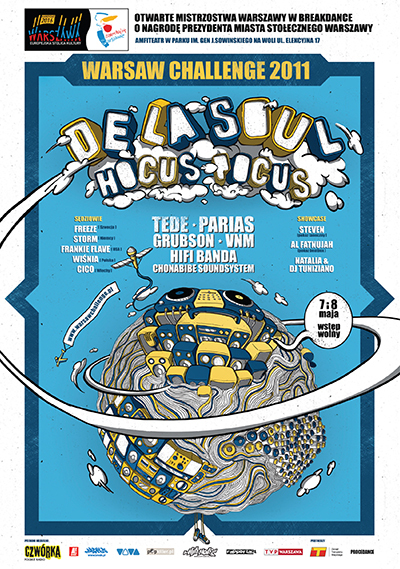 Starting from breakdance tournament with the participation of the 24 best dance crews from around the world, through amazing concerts of the most famous Polish artists, ending with a big concert of hip hop music legends, Hocus Pocus and De La Soul. An additional advantage emphasizing the status of the event in the world is the fact that in the 2011 edition, eliminations were conducted around the world, in Warsaw, Kharkov, Shanghai and Los Angeles.